content online. With a market saturated with single-use tools, we believe there is a strong demand for a tool that produces several interactive web features for both professional and non-professional users. With Easy WebContent Presenter, users can create universally accessible HTML5 presentations, animations, galleries, infographics and more. Presenter is the only HTML5 Cloud based tool that goes beyond simple animation; It is a platform to create variety of content in HTML5 and publish in HTML5 so it works across all platforms and devices. 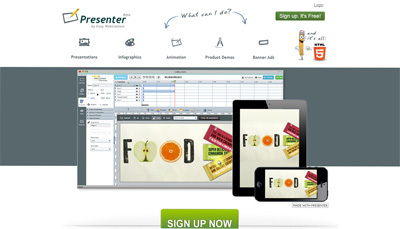 Easy WebContent Presenter makes both novice and experienced users feel equally at home. Whether you’re working on a business presentation, a landing page, or designing an amazing interactive infographic, Presenter simplifies the ability to create engaging HTML5 content through its simple to use tools in a clean intuitive interface allowing anyone to go from creation to publish seamlessly. Create awesome content that is rich, engaging and renders perfectly on all web, mobile and tablet devices. Presenter does not require any plugins, third party applications or any installation as opposed to other competitor tools.